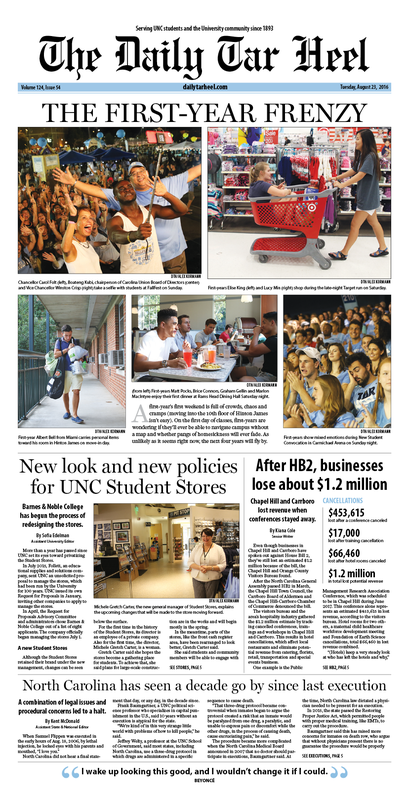 The new school year at The Daily Tar Heel has brought with it more than the usual number of changes. We have a new editing crew — led by Editor-in-Chief Jane Wester. We have a new general manager, Betsy O’Donovan. And we have a new plan for how to deal with the financial challenges of the new media landscape. Jane wrote in today’s DTH about the ways her staff is embracing fear to produce tough, experimental, community-service journalism this year. Thanks to the internet, The Daily Tar Heel hasn’t been “daily” for a long time — we’re much faster than that. We work around the clock to bring you breaking news as it happens, whether it’s 2 p.m. on a Wednesday or 3 a.m. on a Saturday. I’ve asked editors to bring their A-game on Monday nights, and they’ve transitioned faster than I could have hoped from concern — which is, after all, a natural response to change — to excitement. A new sign on my desk says “Embrace fear.” We’re all in. We’re ready. We want to keep getting better, so tell us what you think about our work. My email, editor@dailytarheel.com, is pretty easy to remember, and I’d love to hear from you. I also strongly recommend signing up for our daily newsletter, downloading our app and following us on Snapchat, Facebook, Twitter and Instagram. And Betsy started a new Medium channel for the DTH called Now What Next. In her first post, she described her plan to change the DTH’s business model. Like most newspapers, our historic business model was built on a robust market for print advertising, and a bet that digital advertising could eventually replace it. Print still has power, but we have to forget our old assumptions that we know best what people want. If we want to sustain the DTH’s excellence in journalism, we must provide necessary service (or sets of services) for our neighbors. We have to help solve their problems. In this space, we’ll be writing about our experiments to earn money through public events, providing creative services to local businesses and organizations and whatever we think of next. We want collaborators and partners. We also want to parlay what we have and do into shared knowledge, figuring out solutions and models that can benefit other communities. We can help preserve the community journalism that underpins our democracy. We are interested in finding partners who are doing what we do, and learning together. We are going to work in public — this post is the first of many, and most of our future posts will share a new idea, or report on our experiments as a way of helping other news organizations. In the next few days, you’ll also be hearing about our requests for support in a few key areas. We’re starting with sports travel: Generations of DTH sportswriters and photographers have gained valuable professional experience by traveling to away football and basketball games. You’ll be hearing more about how that experience is crucial and how you can help. If you want to help: Alumni and friends of the DTH can support our mission with tax-deductible donations on a one-time or recurring monthly basis. We are also looking for people with skills and expertise to share as we move forward. Please email us. Another way to help the DTH is to join and stay active in the DTH Alumni Association. Please join our group by registering on this site and filling out your profile. Members get access to our members database, networking opportunities and professional development.